A BUNCH OF SHAMROCK FROM MY DEAR OLD MOTHER. Copyright, 1890, by Frank Tousey. Words And Music by Monroe H. Rosenfeld. And told of those I had not seen for years. This bunch of shamrock from my mother dear. This bunch of shamrock from my dear old mother. I bear the voice that whispered sweet good-bye. "Remember, lad," said she, "and true and honest be;"
Her words within my heart can never die. This bunch of shamrock from my mother dear.- Chorus. I know the daisies wave so gently o'er her grave. And 'round that spot the sweetest mem'ries cling. 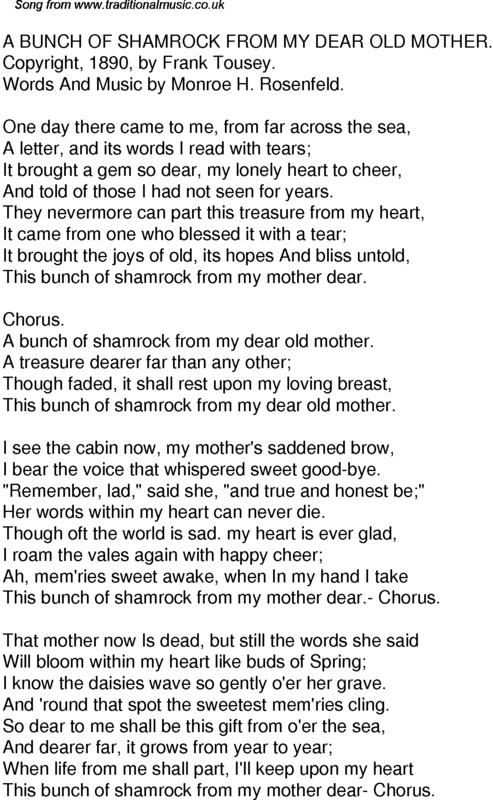 This bunch of shamrock from my mother dear- Chorus.